Years before the housing market collapse, a minuscule group of people saw what everyone refused to accept: that the subprime mortgages had infested the financial world and major companies were capitalizing on issuing loans to people who were likely to default. Some of these wise men even made millions of dollars by betting against the US economy, and they were right, but as everyone knows, what ensued was the catastrophic collapse of the US economy and a worldwide recession. I don't presume to be financially savvy, and probably, like most people, understood just the basics of the housing market collapse, but even though I wasn't a fan of the narration format of The Big Short, I think it helped me navigate the murky waters of the financial world. I'm not even sure I understood everything they threw at me in this movie, and kudos to the production team as well as the screenwriters for even trying, but with the little I think I got, my blood boiled. It made me feel as when I saw Margin Call, another great movie on the financial crisis. 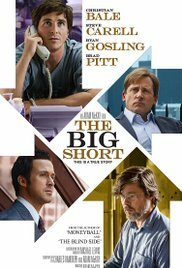 The final message I got from The Big Short is that despite the bailout, financial institutions may be repeating the same formula, and I hate to imagine the consequences if history repeats itself. Could the government impose another bailout on the American people? A great ensemble cast helps propel the story, which is after all, the focus of the movie. Christian Bale (in an Oscar nominated role), Steve Carell, Ryan Gosling, Brad Pitt, and Marisa Tomei co-star. I hadn't thought I would want to see this one, but when I saw the clips shown at the Academy Awards, I changed my mind. I am looking forward to it showing up in my mailbox. This week I will watch Room. Well, I wanted to see it because of its stars, but I ended it up liking it a great deal. I didn't think I was going to understand the complex terms, but I think I grasped the essentials. Lots of good actors and a story based on a book by a very good writer. Sounds like a winner all the way. It is definitely a winner. No, Sarah, I didn't read the book, but Lewis contributed to writing the script, and the director used celebrities that had no links to the financial world to explain financial concepts in layman's terms. I think they did a fantastic job. I thought this was a really good film - very intriguing indeed! I agree; very well done. Yes. I thought this film and Spotlight were the most important ones of the year. Wow this film makes the viewer feel ill about the financial system. That's definitely the case. I felt sick just watching this movie. And I agree about this one and Spotlight. It was a year of many mediocre movies with some good performances in some.